It has been proclaimed a ’future classic’. 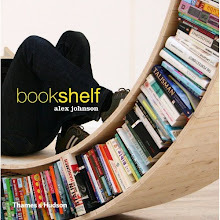 It has been called ’innovative’, ’the world’s most beautiful bookshelf’, ’a pearly drape for books’. But Cell, designed by Peter Cohen, is also a hightech shelving system, brilliant in its design and use of space. Cell looks incredibly light, with its paper-thin shelves and its sleek appearance. People tend to ask “what can you put on it?” The answer is that you can fill it with books; as many books you can fit in the rack - without a hint of bowing in its thin laminated steel shelves.